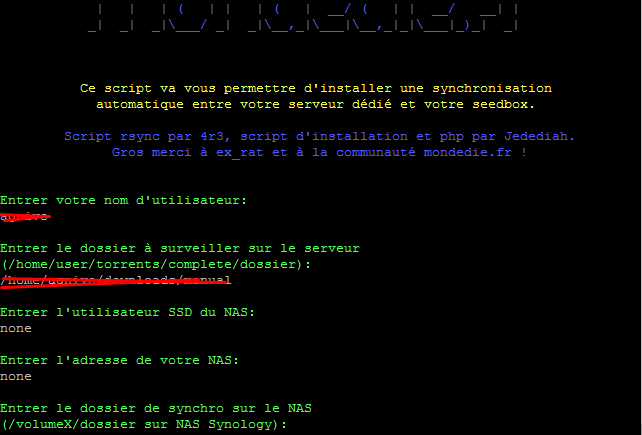 Here is a exellent script for syncronise your seedbox and NAS. Once you run it you will get the below question , It is in French so you might have to use a bit of google translate to make sense of it . Thats pretty much it once you have set everything up you will have a runnign sync between your seedbox and NAS. If you want to sync more users you have to just run the script again.Which would look something like this, remember to login as root in your seedbox server. and then follow through the instructions again. You can also save it as a script if you do it often.